I have played my first MP games as the Supreme Commander in 2by3+ (still going on ) and Chief of Staff in TTG ( still going on), I was a ground commander in Connect 4 ( no longer exist) and I was ground commander in BlitzFour ( no longer exist). 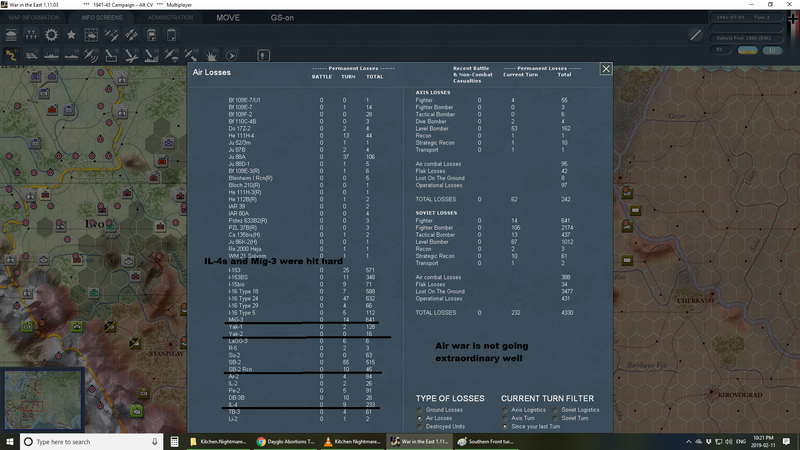 Both my games where I am a ground commander either never started yet (B4) or was abandoned in the first few turns ( C4). I am not a very methodical, expert like some of my colleagues became to be in those games. I consider myself more of a..
brute zerg player ( if that make sense for some of you ). I am not very experienced and this is my first real multiplayer game. 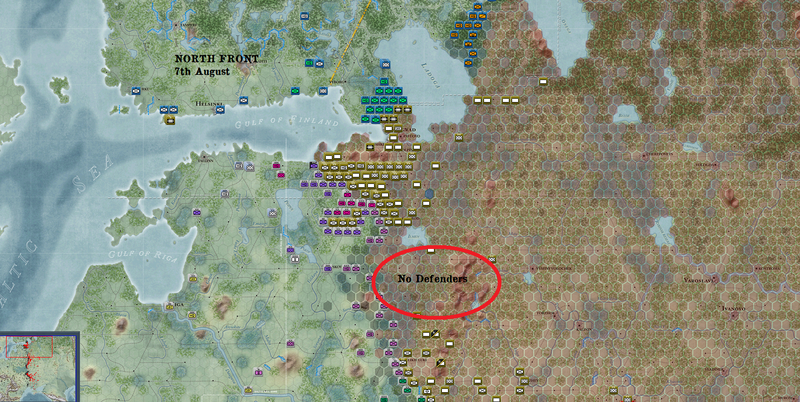 A couple of days ago, I embarked into a game against TheLysander and this will be the AAR. I am not looking for advice as it wouldnt be very fair to my opponent but you are free to leave your thoughts on everything I post. We started the game yesterday or the day before, and we are now at turn 6. My first post will be about Turn 1. Model was changed into 1st Corps of 18th Army for that extra punch. 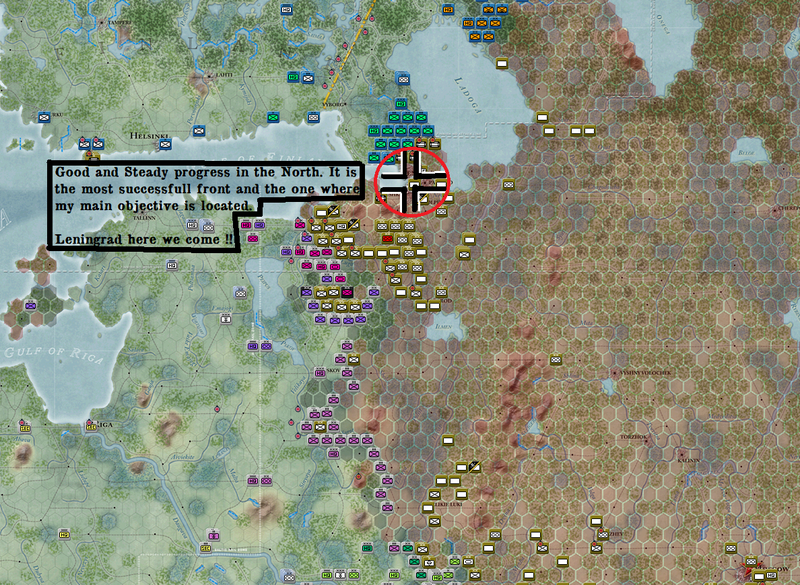 The opening moves of the Northern Front went particularly well. Rige was captured and a bridghead accross the Daugava river was established close to Daugavpils. Infantry divisions captured Kaunas and kept moving forward. Not much to go on here. Central Front went particularly well. Brest and Vilnius were captured. A large pocket was formed. Minsk was at a door step away. 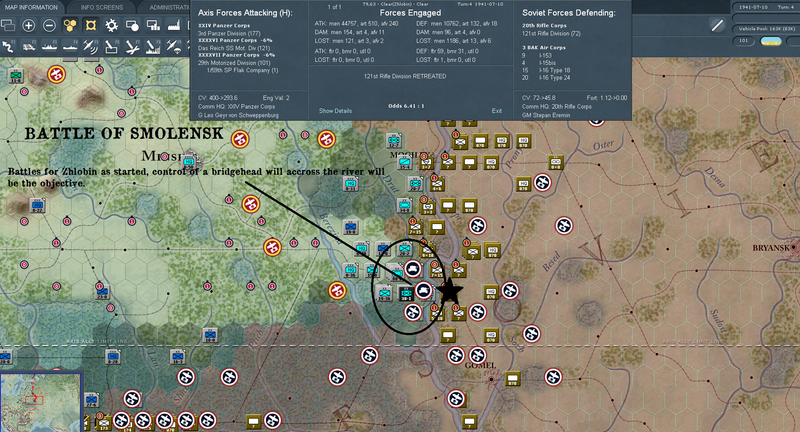 3rd Pz.Gr's objective is to capture Smolensk and meet 2nd Pz.Gr to form a pocket. 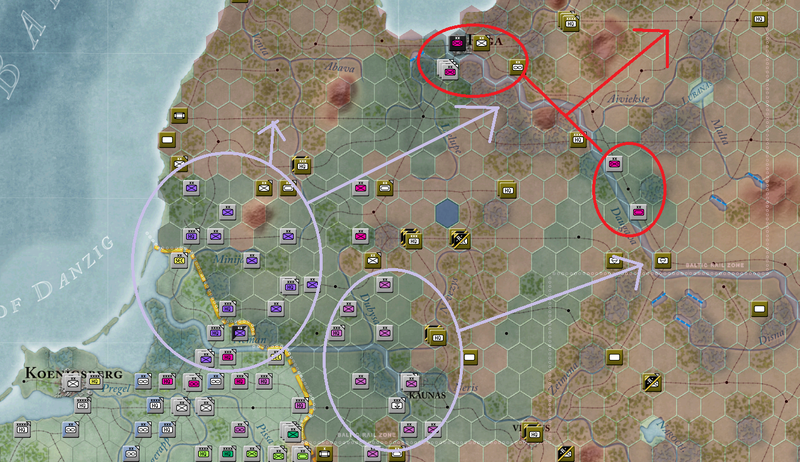 2nd Pz.Gr's objective would be to secure the bridge at Gomel and to close the pocket in Smolensk. 9th army would secure all pockets and rush to the Dnepr river. 4th Army would rush to Gomel. 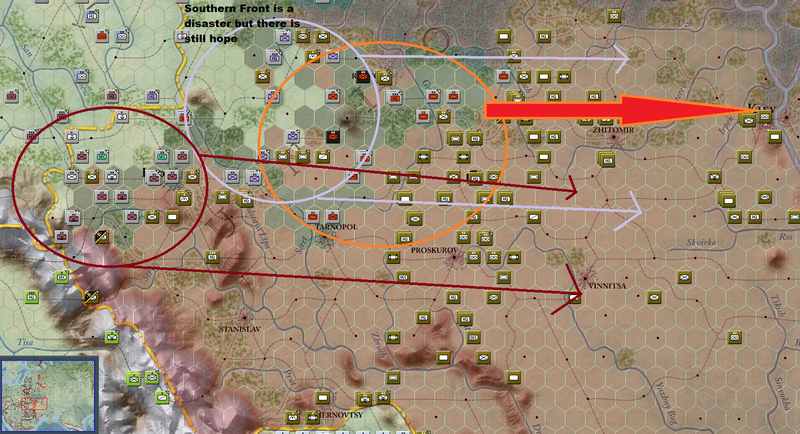 Southern Front didnt go particularly well. 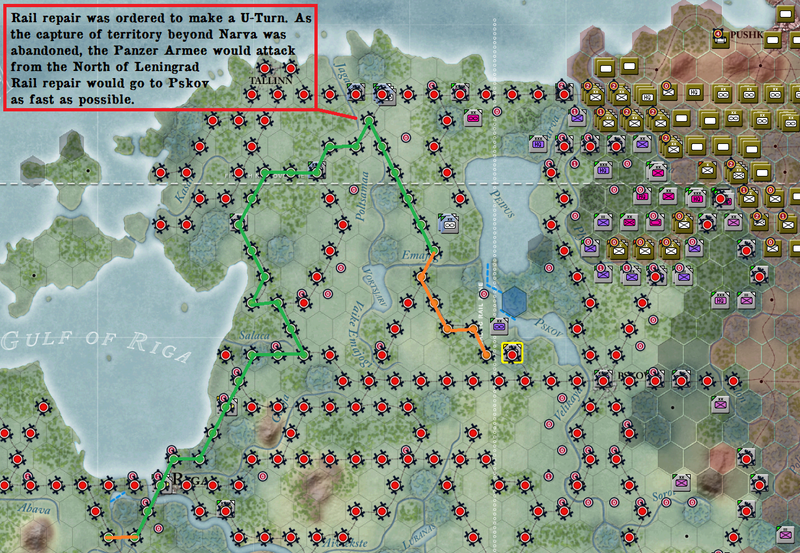 All armies were ordered to go to Kiev and in a way, this is what happened, but I was hoping for a bigger push. on its way to exploit the hole made by the Pz.Gr. Nothing else to go on about here. Percentage required to fly is set to 0%. Recon is done on airfield. some Recon. Small numbers compared to others, but an efficient one Im happy with. 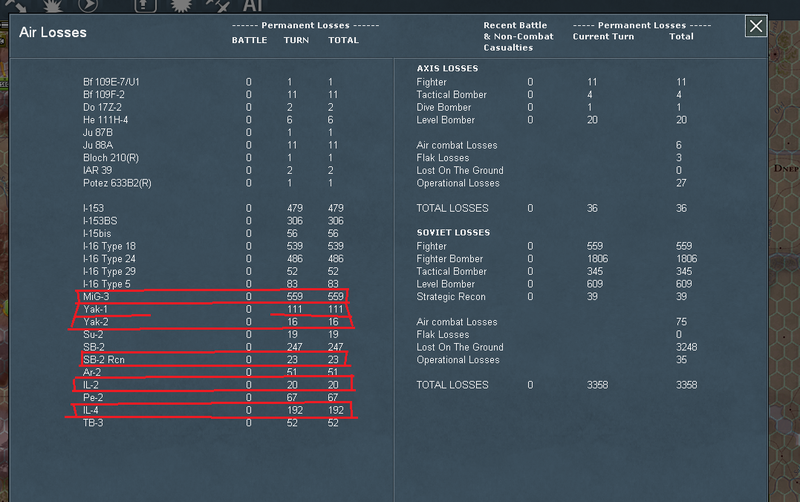 Migs-3s and IL-4s were hit pretty badly. Nothing much happened here. I regrouped my Pz.Gr and made an HQBU. Objective is stated to go to Narva. The rest of the infantry keeps pushing. Security Divs. and White divs are use to mop up the pocketed units. 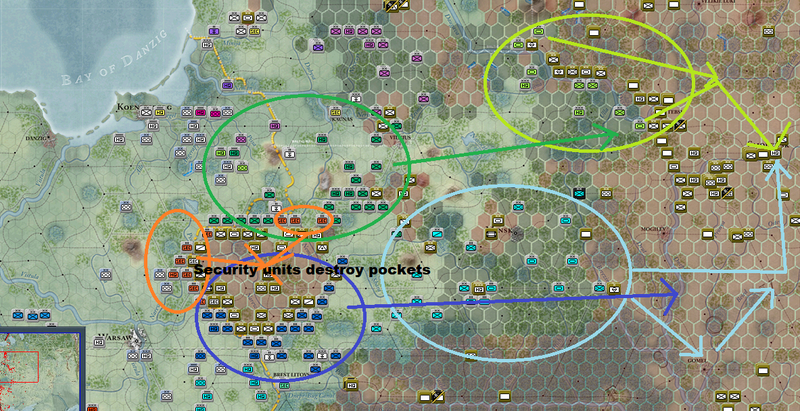 Infantry Armies were stuck keeping the pocketed units at bay. Security divisions are being brought forward to mop up. The Inf. Armies will proceed to go forward as soon as possible. in order to distract the enemy from the real position of engagement for the battle of Smolensk : Polotsk. Hoth will push trough Vitebsk to gain Smolensk. a lot of enemy resistence in Gomel, and so only a few divisions will be giving the order to capture the town. The others will go to Smolensk to form a pocket. Nothing out of the extraordinary here, we will see how it develops. Southern Front has turn into a disaster. Progress is slow. Same objectives are being expected to be achieved. 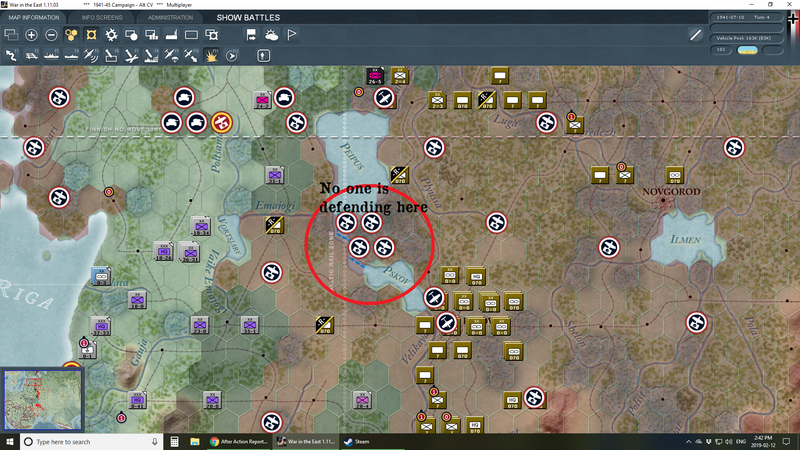 HQBU was a success and the Pz.Gr went all the way to Talinn and at the doorstep of Narva. line in front of Pskov. Security units along with some of 4th army were busy mopping up. 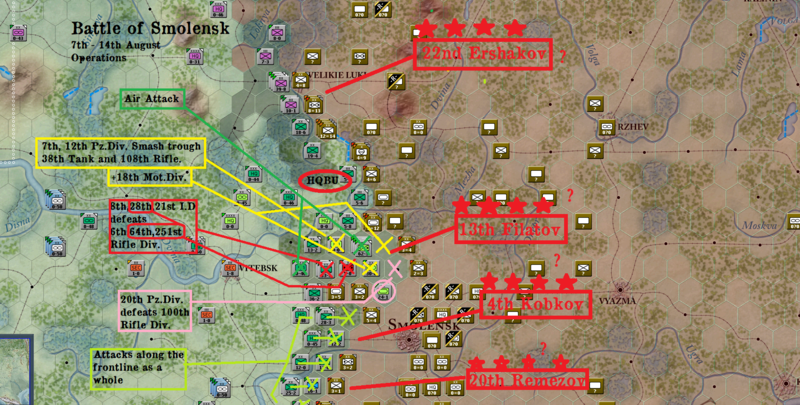 Other elements of 4th army started their advance to Smolensk. 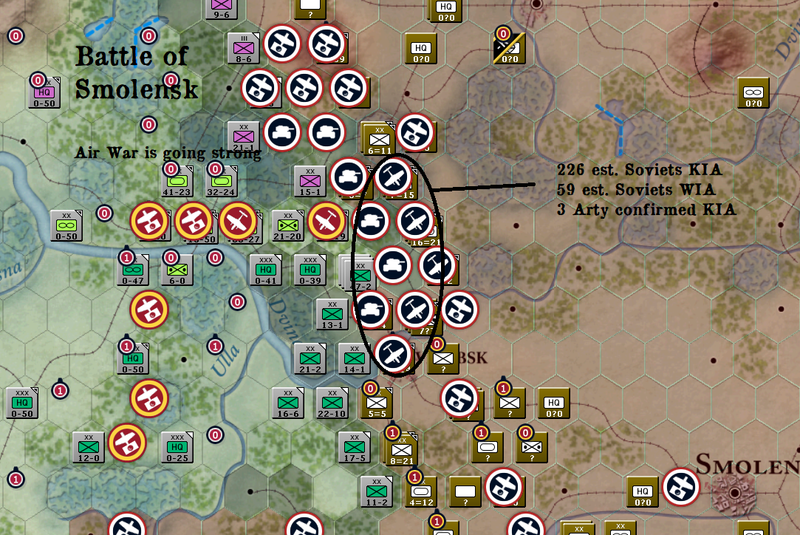 9th Army was beginning to rush to Smolensk. 2nd Pz.Gr is starting to arrive near Gomel. Same old same old in the Southern Sector. The Pz.Gr is getting closer to Kiev, while putting itself in a dangerous position. Pocketing of some of its divisions are expected. 16th Army was still arriving in front of Pskov. 18th Army was moving rapidly trough the Latvian tunnel created by 4th Pz.Gr. 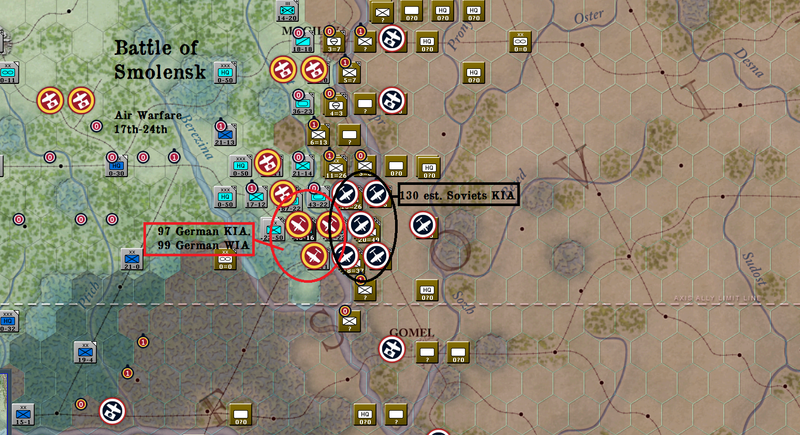 4th Pz.Gr started their assault to Narva. 9th Army finally arrived at destination, one more week to get them in order for some units to be able to be operational. Elements of the 9th crossed Dnepr the river and took position with 3rd Pz.Gr in support of a push trough the Forest leading to Vitebsk. Air Recon showed a large formation of Reds in the swamps and so it had to intervene, HE-111 bombers were sent to bomb them. More delay for them in order to arrive near Gomel. 2nd Reserve Army is helping up mop up the Soviets with the Security divisions. Both Pz.Gr. has started their assault on Smolensk. objective. Leaving elements spreaded out quite a bit in order not to tip the enemy on his next move. 17th Atmy was still pushing slowly and taking care of mopping up units and pockets. 6th Army was ordered to establish a defensive line in front of Kiev and at the same time, attack from the North. Axis Minors would continue to push slowly towards Odessa. Plans to make Von Kleist move to Odessa was starting to brew but ultimately, it was decided to stick with Cherkassy. Turn 5 is a bit less detailed but I still have pictures. 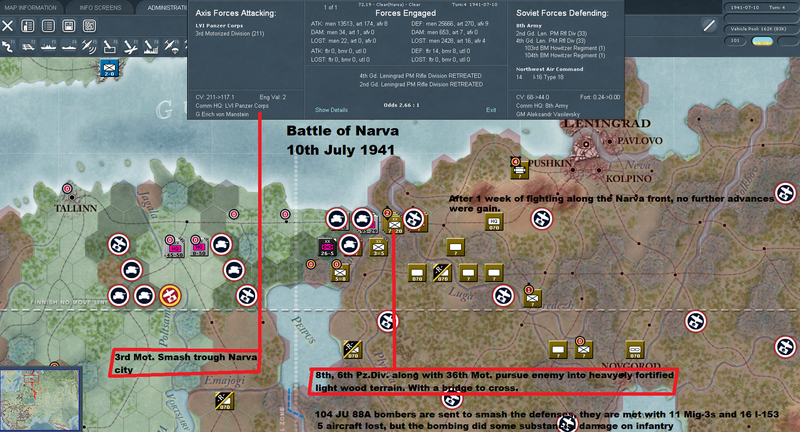 he Battle of Narva took place on (the 4th turn) 10th July 1941. Just south of Sillamae, trough the light wooded terrain, with no air support. Von Manstein employed the LVI Corp's 3rd Mot. Div. to do the initial clash that would start the Battle of Narva. At 4:44am, elements of 3rd Motorised Division advance and met elements of the 2nd and 4th Gd.Len.PM Rifle Divisions, supported by Howitzer regiments and several I-16 Type 18.
under constant probing attacks of I-16. The battle in Narva continued until 8am, when, the Red Army once again retreated. blocking the path for the infantry and other vehicles. 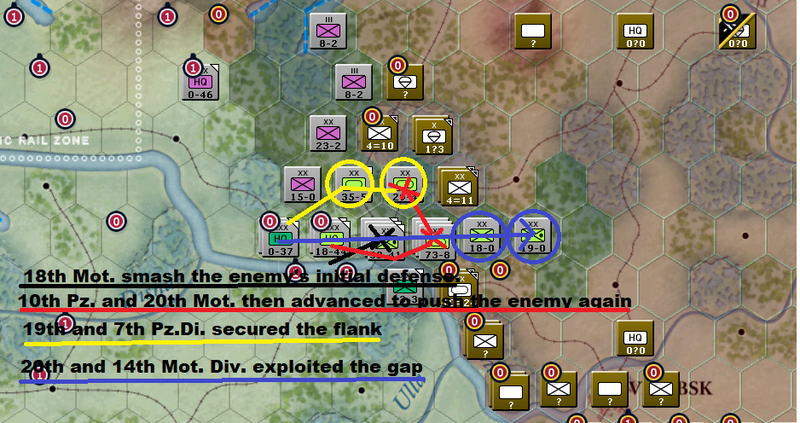 After several attempts and hours passed, the attack was cancelled and the divisions regrouped into Narva. the Reka Narva river. At the same time, Totenkopf Div. pushed back the 2nd Len.PM Rifle Div, and the 1st Pz.Div made pushed back the 10th Rifle div. All located in the South-East sector of Narva. By the 23rd July, all Soviets had retreated and abandoned position, the Germans were getting ready to advance and by-pass the Ivangorod Fortress. Meanwhile, 18th Army air recon was still indicating no enemy presence in the Chudskaya Rudnitsa. 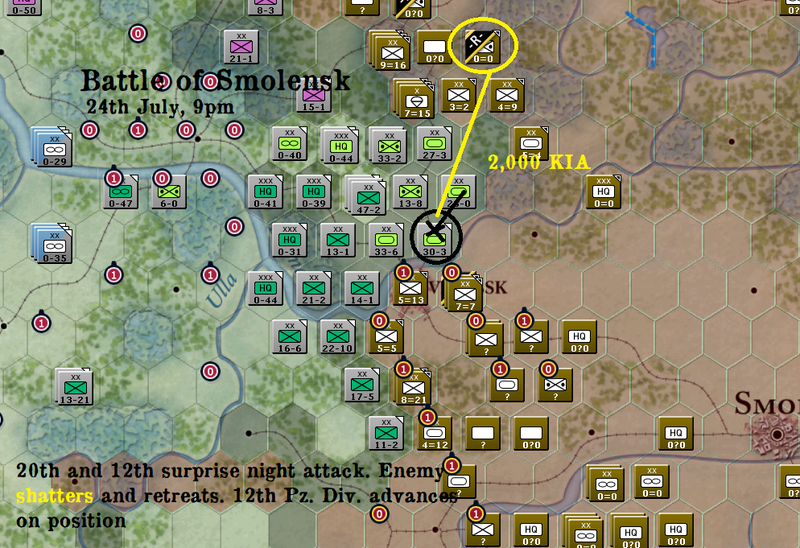 On the Morning of 17th July, the battle for Smolensk was starting to rage, there has been a few skirmishes the week prior and now the Pz.Gr were ready to be in full swing. Thousands Soviets died in the few hours that span the skirmish. The road was now open to the armor divisions. 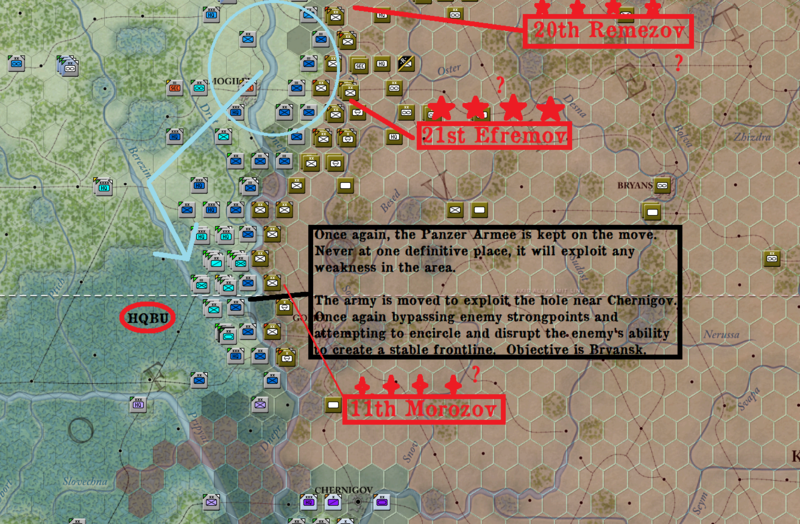 I forgot all about Southern front, sorry, but it was basically the same thing, and move progress towards Cherkassy. Status: offline The lunge across the Narva is really cool, he might be in danger not covering the swamp crossing near pskov as well. The escaped units in the south may hurt you in the future, however. Status: offline Great stuff man! What's the Soviet OOB looking like so far? Status: offline If you set the % to zero shouldn’t this mean no planes will actualy fly? Great job in AGN though hopefully Leningrad will be yours in no time! Thanks. Yes a lot of troops in AGS. I am really struggling down there. Will wait a bit before posting other pictures, but the next turn is really looking good :P ) At the rate of 3 turns per day, it should go quickly though. I spend more time editing in Microsoft Paint than on the actual game haha. Status: offline No lvov will be an issue, but as long as you can achieve encirclements and take the key cities of the north you should be fine. Haha well from the completely selfish point of view of the reader this is a great thing as it means I get to read more the AAR! Status: offline very intresting. you did much better than me in my first game. no lvov pocket means that the enemy has some high quality infantry, armor and mountain infantry units to cause problems but your move in the north was very refreshing. Status: offline Hey, great AAr, thx for taking the time doing it. I just finished a game against your opponent Lysander and he is a good player. I beat him while playing the Soviet (he had to quit in March 44) and for me it's great to see him play the other side now. He's good with surprise armored breakthrough and mega-pocket, just a friendly warning...:) ! Status: offline Well done AAR. From my armchair general perspective, letting the green and blue PG operate separately is questionable. As can be seen here, one PG on its own has not enough striking power to form even single stack pockets if facing the Soviet wall of steel. In my first GC1941 vs humans as Soviets my opponent did the same, and his breakthroughs constantly threatened, but barely succeeded with encirclement. 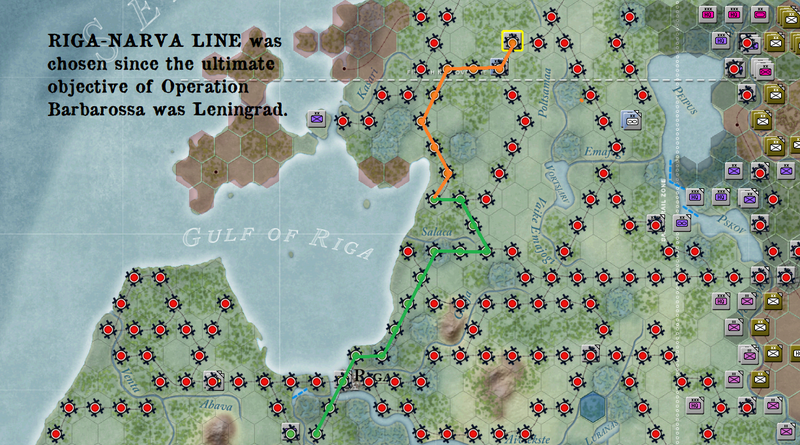 Status: offline If I may suggest, in north don't try to assault Leningrad from Narva. I would rather outflank him from right towards Novgorod. This will also force him to abandon position around Pskov. Status: offline Oh were far from there now in the game already. 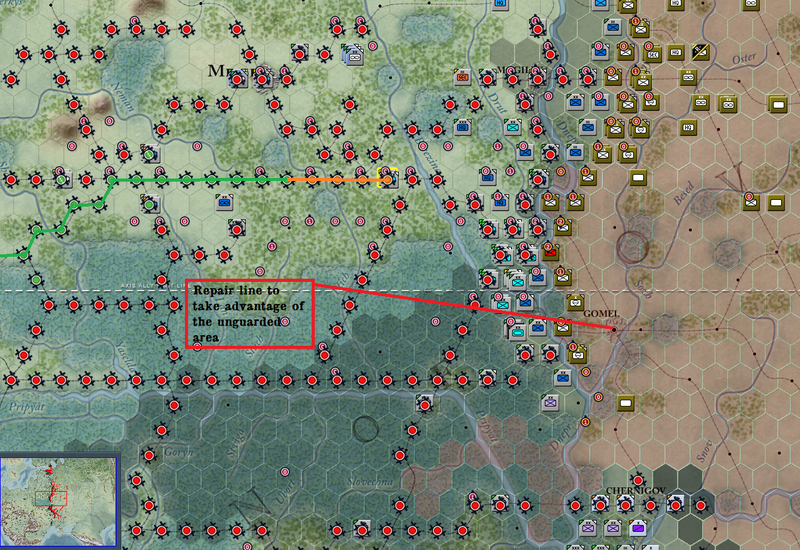 If I may suggest, in north don't try to assault Leningrad from Narva. I would rather outflank him from right towards Novgorod. This will also force him to abandon position around Pskov. All depends on how the Soviets react. But in the end it is still the short end of the stick for the Soviets no matter what the Germans do. 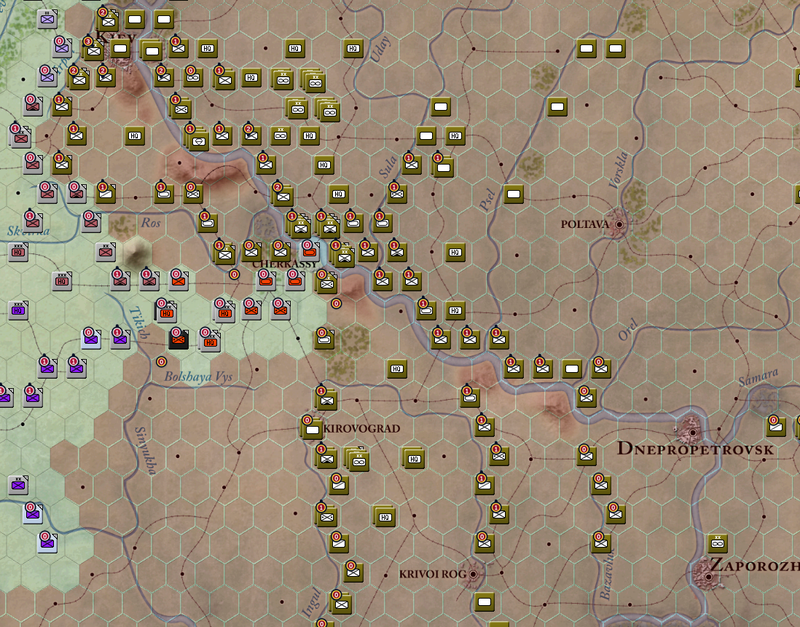 1 NKVD divisions and 1 Motorised, we can expect the battle of Narva to be over by next week. Leningrad. Making place for the Battle of Leningrad. 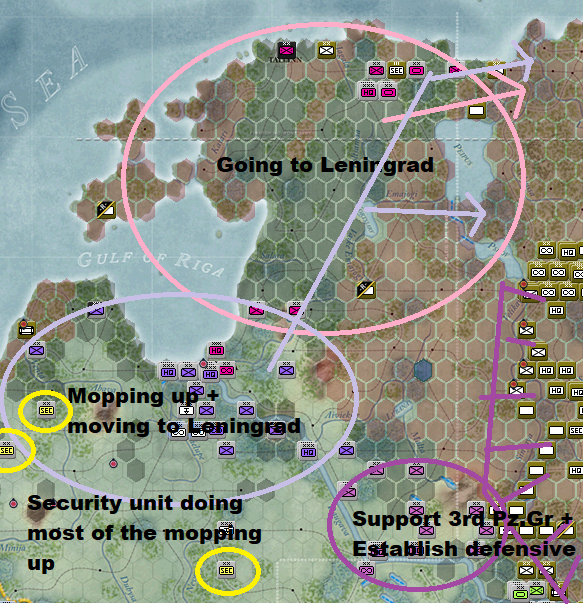 in order to attack Leningrad. 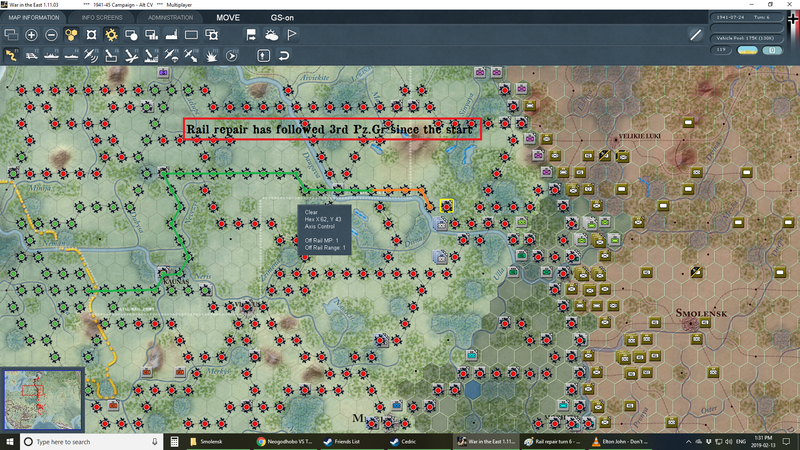 The rail repair was diverted to that effect, to go trough Pskov instead of going for Narva. 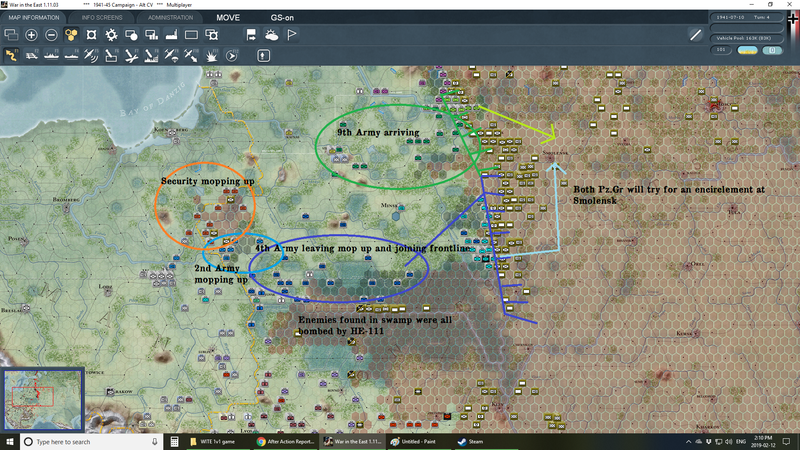 Status: offline Great AAR and especially awesome maps and description of operations ! Status: offline Loving the maps boss, really great stuff!!! 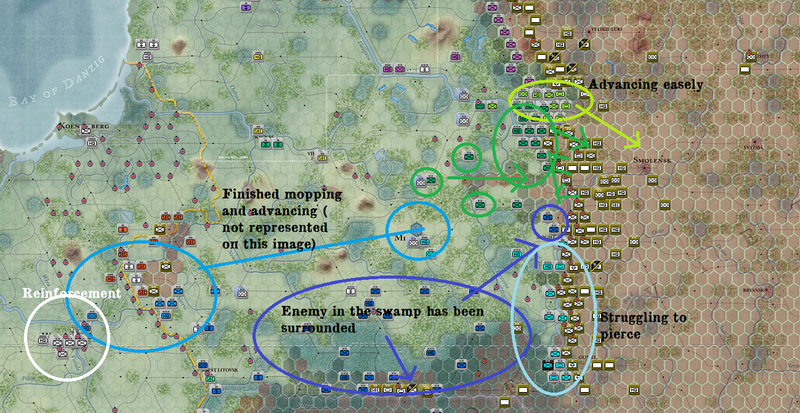 Great AAR and especially awesome maps and description of operations ! Apparently visiting a museum to inspect a Valentine tank is NOT romantic. Status: offline Well Thanks everyone, I appreciate the feedback.